1. How Does Insulation Help Control Condensation? When piping and equipment operate at temperatures lower than the ambient air, moisture in the air will condense, or freeze, on or within the insulation surface - or on the cold pipe surface. Unless the system is protected by sufficient thickness and by adequate vapor retarders, the insulation can become wet, causing corrosion, and causing it to become ineffective. Specifying sufficient insulation thickness with an effective vapor retarder system is the most effective means of providing a system for controlling condensation on the membrane surface and within the insulation system on cold piping, ducts, chillers and roof drains. Sufficient insulation thickness is needed to keep the surface temperature of the membrane above the highest possible design dewpoint temperature of the ambient air so condensation does not form on the surface. Degrading system service life and performance. Mold growth and the potential for health problems resulting from water condensate. Corrosion of pipes, valves and fittings caused by water collected and contained within insulation system. Firestops are products specifically designed to stop smoke, toxic fumes, super-heated gases, and fire from migrating from one room to another, or from one floor to another. Firestops are used to restore the entire structure, via each individually penetrated partition, to its original fire-rated integrity. Firestops are available in a range of products to accommodate the multitude of different types of penetrating items passing through the different size openings. All firestopping should be done in strict accordance with local building codes and National Fire protection (NFPA) guidelines. Material should be installed according to manufacturers specifications by qualified craftsmen. 3. How and Why is Insulation Used to Control Sound? Sound attenuation, or the limiting of sound propagation from one area to another, requires the application of special and standard insulation materials to encase or enclose the noise generating source, forming a sound barrier between the source and the surrounding area. Reduce obnoxious noise levels emitting from machines, equipment, pipe lines or enclosures. Reduce general noise level in plant areas. Provide for better work conditions. Comply with noise level standards of OSHA and EPA. 4. What Are the Insulation Selection Criteria for High Temperature Systems? Examples of super hot systems include high pressure steam lines, process lines, exhaust systems, or any systems that operate at temperatures from 601°F to 1500°F. Reducing heat loss and protecting personnel is the primary reason for installing insulation in hot environments. What are the process temperatures? What's in the process and in the exterior environment? Is the piping located around people? 5. How Do You Choose the Right Insulation for the Job? 1. What is the operating or line temperature of the system your customer needs to insulation? Low Temperature Range (-100°F to 60°F) Refrigeration, cold/chilled water and commercial heating and cooling systems. Medium Temperature Range (61°F to 600°F) Hot water and steam, power/process piping, ovens and stacks. High Temperature Range (601°F to 1500°F) Power generation, turbines, kilns, smelters, exhaust systems and power piping. 2. Is the system outdoors or indoors - or a combination of both? This will help you determine whether or not the system and the insulation needs protection from weather, corrosive atmospheres, water or chemical washdowns, abuse or other conditions. 3. Is the ambient temperature constant...or will it fluctuate? The answer to this question will guide you in the selection of the appropriate thickness to protect against condensation, heat loss or gain or other temperature control problems. 6. What Kind of Things Should You Consider When Insulating Cold Process Systems? Low temperature systems such as those needed for refrigeration or chilled water range from -100°F to 31°F. Supermarkets and food processing are typical of these system environment. Cold water systems such as those used for water supply HVAC systems generally range from 32°F to 60°F. Cold water systems require special attention because one must design for protection against condensation and consider the affect of moisture or water vapor transmission (WVT) on the insulation system. WVT tells you how much water will be transmitted through an insulation system under certain conditions. Different insulation systems, vapor retarders and installation methods will affect the WVT of the system. Condensation control and process control are two major reasons for insulating low temperature systems. When equipment or piping operates at temperatures lower than the ambient air, moisture in the air will condense or freeze on, or within, the insulation surface - or on the cold pipe surface. Unless the system is protected by sufficient thickness and by adequate vapor retarders, the insulation may become wet, causing corrosion, and causing it to become ineffective. 7. What is the Difference Between HSPP and CHSPP? NAIMA's Health and Safety Partnership Program (HSPP) is a voluntary worker safety program developed by the insulation industry to maximize protection for workers who use synthetic vitreous fiber (SVF) products. The Program commits fiber glass insulation manufacturers to use product design, engineering controls, work practices, respiratory protection, or a combination of any or all of these measures to bring fiber exposure to the voluntary 1 f/cc PEL. 8. What is an Insulation Energy Appraisal? An insulation energy appraisal puts actual dollar savings to Btu losses and calculates greenhouse gas emissions such as CO2, NOx and CE (Carbon Equivalent). An appraisal is based on data supplied by a plant/energy manager and gathered during a facility walk-through. This data is fed to a computer which calculates the energy used and the savings on any operating period or annual basis. This data is invaluable for companies that want to make sound decisions about a technology that offers tremendous payback over the life of their facilities. 9. Where Can I Get Information on Specifications? Understanding specifications is an important part of the job. NIA provides members with a guide booklet entitled: Guide to Insulation Product Specifications. 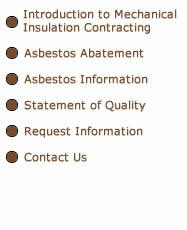 U.S. Government which publishes federal and military specifications for insulation materials. Some of the performance specifications that you will need to become familiar with on the job include water vapor transmission, compressive strength and fire hazard classifications. You'll find that a 25/50 rating for fire hazard classification is required for most codes. The 25 represents the flame spread index and 50 represents smoke when compared to cement as "O" and red oak as "100". ALWAYS check the manufacturers' specification sheets for specification compliance information. 10. How Do You Determine Which is the Right Protective Covering and Finish? 11. What is Meant by K-Factor, R-Factor and C-Factor? K-Factor (Thermal Conductivity Factor) - the actual K factor number for an insulation material is based on the number of Btus per hour that pass through a 1" thick by 1" square block of insulation with a 1°F temperature difference between the two surfaces. Materials with lower K-Factors are better insulators. When comparing the insulating value of different types of insulations, it's important to look at K-Factor and the mean temperature. As mean temperatures rise, so does the K-Factor. C-Factor (Thermal Conductance Factor) - C-Factor is the number of Btus which will pass through square foot of material with 1°F temperature difference for a specified thickness. The C-Factor is the K-Factor divided by the thickness of the insulation. The formula is the reciprocal of the R-Factor formula. The lower the C, the better the insulator. R-Factor (Thermal Resistance Factor) - The National Commercial & Industrial Insulation Standards Manual defines R-Value as - a measure of the ability to retard heat flow rather than to transmit heat. "R" is the numerical reciprocal of C, thus R=1/C. Thermal resistance designates thermal resistance values: R-11 equals 11 resistance units. The higher the "R", the higher (better) the insulating value. 12. What is the Difference Between Mean Temperature and Ambient Temperature? Temperature is a property unto itself. It is not a measurement of the amount of heat present. For example, if you pour two cups of coffee, one to the brim, and the other only halfway, the temperature will be the same in both cups, but the partially filled cup will only contain half the heat (Btus) of the full one. Mean Temperature is the average of the sum of a hot surface temperature and a cold surface temperature. Insulation conductivity (K-Factor) is tested at a number of mean temperatures to develop conductivity curves that simulate actual service conditions under which insulation systems are sued. All conductivity figures (K,C,R) must be qualified by a mean temperature. Ambient Temperature is the average temperature of the medium, usually air, surrounding the object under consideration. 13. How do I find Material Safety Data Sheets (MSDS)? Contact the manufacturer directly for Material Safety Data Sheets (MSDS).